This is a micro-inverter DC voltage to AC from a 12v battery can generate a voltage of 110 or 220 volts AC and a frequency of 50Hz to 60Hz. The circuit is very simple and does not need a printed circuit board, It is composed of two transistors oscillators that generate the square wave pulse to the transformer in the case is 10 +10 and its output 220V or 110V. 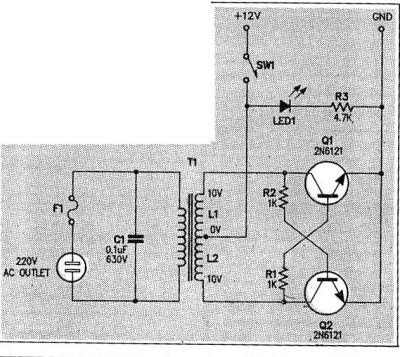 This circuit is 50Hz, but can be changed by changing the value of RC . 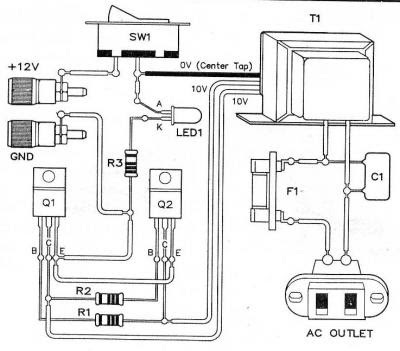 This circuit has the power transistor and that depends on the transformer.